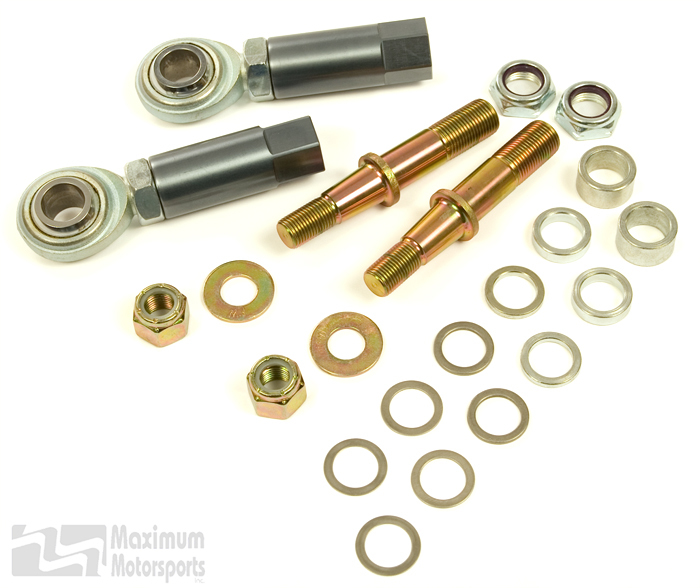 Bumpsteer kit with adjustable outer tie-rod ends for correcting bumpsteer on 2005-2014 Mustang. Tapered-stud style. Fits both 2005-2010 Mustang steering rack and 2011-2014 Mustang electric power steering rack. Allows adjusting bumpsteer to fine-tune the steering geometry for improved handling. Exclusive MM spacers are stronger than others, will not buckle when the nut is tightened. Assortment of spacers allows precise fine-tuning of bumpsteer. Direct bolt-on installation, no drilling of the spindle. MM-designed tapered stud with rolled threads (not the weaker machined threads found on other tapered studs). Studs are heat treated for maximum strength. Longer spacer bushings are made of thick-wall steel to ensure they will not buckle when the 5/8" nut is properly tightened. A variety of spacer thicknesses ensure the ability to properly adjust bumpsteer. Black anodized aluminum adapter sleeve is threaded to match 2005-2014 inner tie-rod ends. The stock tie-rod geometry on the 2005-2014 Mustang induces a significant amount of bumpsteer. This was purposely designed to increase understeer when the car is pushed hard into a corner. This excessive bumpsteer is particularly noticeable when the vehicle is lowered. These Adjustable Tie-rod Ends allow the bumpsteer to be adjusted and dramatically reduced, reducing understeer and improving stability and overall handling. "Bumpsteer" refers to changes in the front toe setting as the suspension moves up and down. If the toe setting changes, the car will steer itself, without any input from the driver. This makes the car feel unstable and unpredictable over bumps, with body roll, or during brake dive. Read StangTV's article about this and other MM parts for S197 Mustangs.